These Jalapeño Cheddar Cornbread Bites make the perfect topping for chilis, soups and salads! In the fall and winter I love to make lots of soups and chilis, and I like to come up with creative toppings to give them a little extra flair. 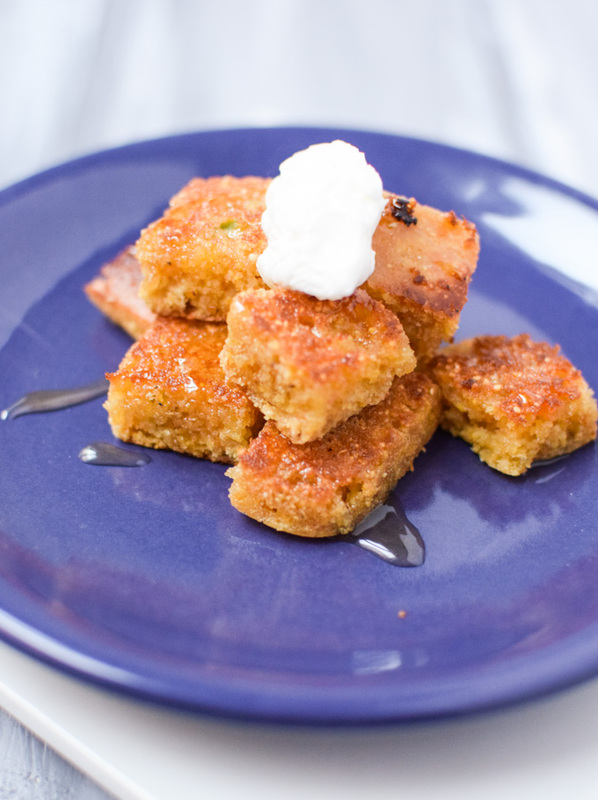 I originally made these cornbread bites to go with my Amber Turkey Chili recipe, however I got asked about them a lot so decided to create a separate post. In addition to being a great topping for any type of chili, these mini cornbread muffins also go really well with lots of different soups or as a side for a meal. Instead of using canola oil, I used safflower oil in this recipe. I’ve actually been using Chosen Foods Safflower oil a lot lately, as it is designed for higher heat cooking. I’ve also been known to eat these all by themselves, slathered with a bit of butter and drizzled with a little honey, as an afternoon snack!! Mini Muffin Pan – I love making mini muffins, they are great for a quick snack and good for portion control too. This pan also works great for mini quiches and other small tarts. They generally come in 12 or 24 muffins per pan. Large Whisk – A whisk with a large head works well for stirring batter like this cornbread. I have several different sizes and types of whisks, as they are a super handy kitchen tool. Preheat oven to 375°F. Spray two mini muffin pans (24 muffin cups) with coconut oil or other cooking spray. In a medium mixng bowl combine the cornbread mix, egg, water and oil. Mix with a whisk until well combined. Add cheddar cheese and jalapeño, mix well. Using a tablespoon sized cookie scoop, scoop the cornbread mix into the muffin pans. Bake for 12 minutes, until the edges begin to turn slightly golen brown. Remove from oven and let cool. Use immediately or place in a freezer bag and freeze for up to two months. I love cornbread and soup and this looks so good! I have seen Bob’s Corn Bread in the market but have yet to try it. Will definitely do so now! Thanks Raquel. I’m a big fan of many Bob’s Red Mill products, so I’d definitely recommend checking them out. Yes. I love this idea. So much better than your average crouton.